Space Marshals for iPad is a top-down shooter that pulls you in quickly and will have you surprised when you next look up at the clock. It has great arcade graphics, easy-to-learn controls, and plentiful levels for you to explore while you accomplish missions and avoid the bad guys. In Space Marshals you play a western-style marshal, complete with six-shooter and ten-gallon hat. You’re on an alien planet, hunting down escapees from a prison break. An AI computer and various human characters show up along the way to help you through a series of missions, each taking place on a different part of the planet. For example, in an early mission, you sneak around a base, trying to disable tracking radar so you and your buddy can make a clean getaway in a stolen ship. A helpful overview map stays in the top right of the screen giving you a condensed view of the level and your goals. You inhabit a top-down but 3-D world of space bases of various sizes and difficulties. The graphics are very good arcade quality, gameplay is very smooth and responsive, and I never experienced a system crash. Bad guys show up with red auras around them and you can usually see them coming before they sneak up on you. To reach your mission objectives, you move around buildings, shipping containers, and fences while trying to avoid the bad guys, or get the drop on them and send them to meet their maker. You can walk, run, and crouch as you sneak around. If push comes to shove, you have an array of weapons at your disposal, including a shotgun, revolver, and (my personal favorite), pipe bombs. You can also collect shields and health kits, which you’ll need a lot of. 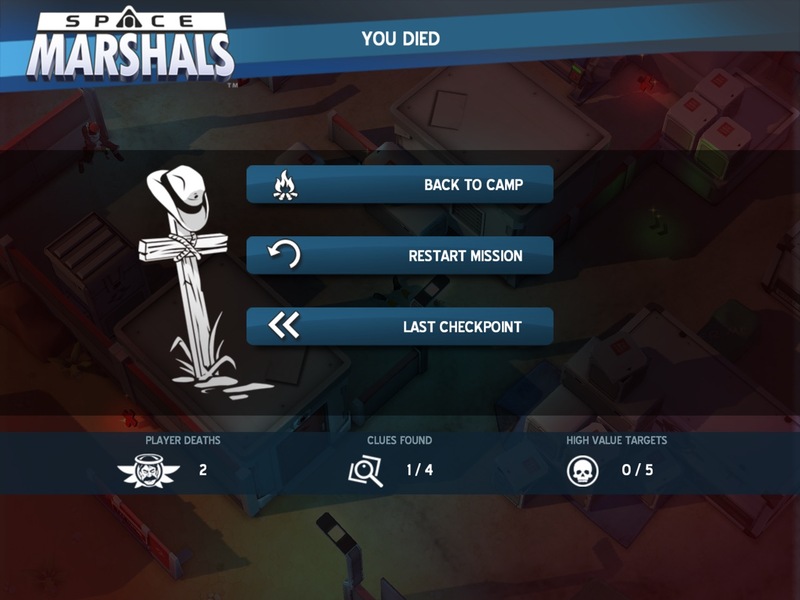 Which brings me to the only possible downside of Space Marshals, depending on your frustration level: you’re going to die a lot. In any gun fight, you’re outgunned and your opponents can take a lot more fire than you can. You need to avoid confrontation whenever possible. Depending on your preferences for creating death and destruction, this may be fun, or may be limiting. If you’re a run-and-gun mayhem dealer, this one may not be your cup of tea. 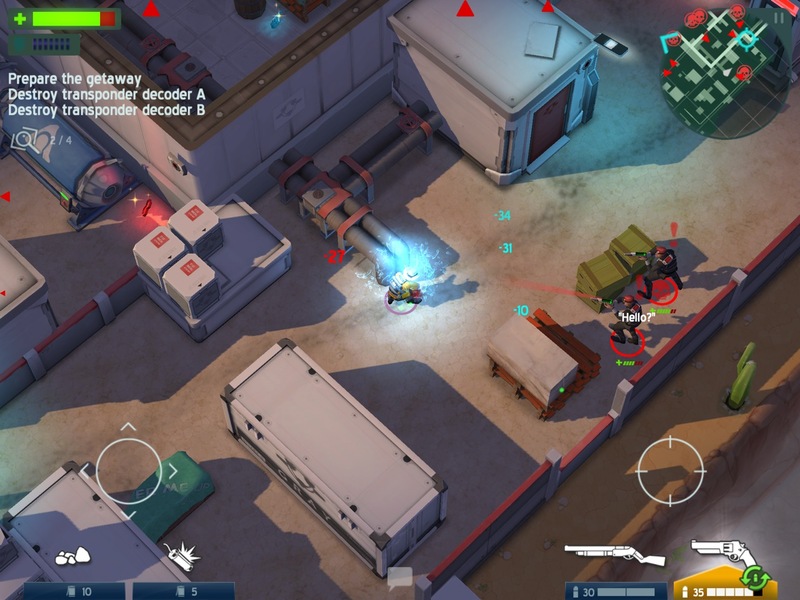 If you judge games by how much time you spend in them, then I have to give Space Marshals a thumbs up: I always want just one more try to pipe-bomb that sleeping guard. 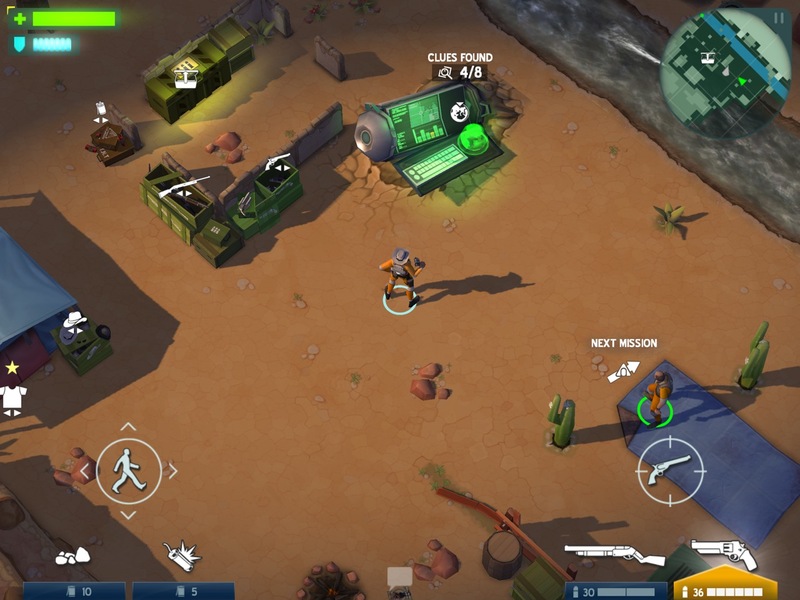 Here’s an App Store link for Space Marshals; it’s priced at $4.99 with no in-app purchases ever needed. Some may say that’s lot for an app, but for the price of a venti macchiato, this game will give you infinitely more hours of enjoyment.